Choose your own adventure in our breathtaking canyons or sprawling caves. 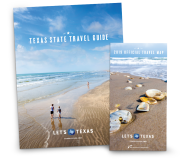 Explore the cities of Texas for a little taste of everything each region has to offer. All Material © 2019 Office of the Governor, Economic Development and Tourism. All Rights Reserved. Reproduction in whole or in part is prohibited without the written permission of the publisher.